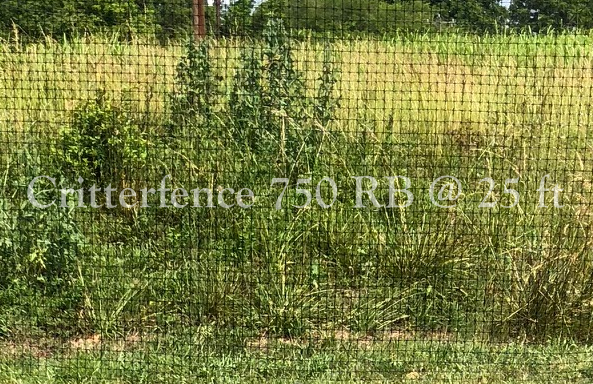 The highest quality and least visible deer fence materials on the market - create your own nearly invisible deer fence to keep deer out and animals in. Not all deer fence materials of this type are the same. Our deer fence kits and garden fence kits are designed to be installed by homeowners and contractors alike. Put together by standard tools, we believe we offer the highest quality, easiest to install, most effective and least visible fence materials of this type. Professional strong and long lasting do it yourself fence for homeowners, contractors or anyone needing to keep animals in or out. Most traditional fence leaves gaps at the bottom for animals to get through. 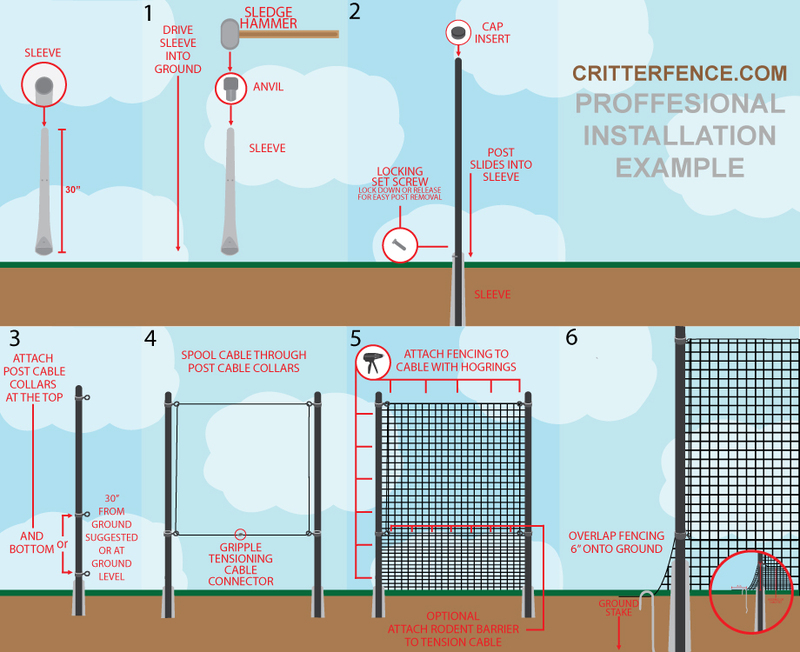 Our fence kits with overlap include extra fencing to overlap onto the ground and pin to the ground so animals can't get through. 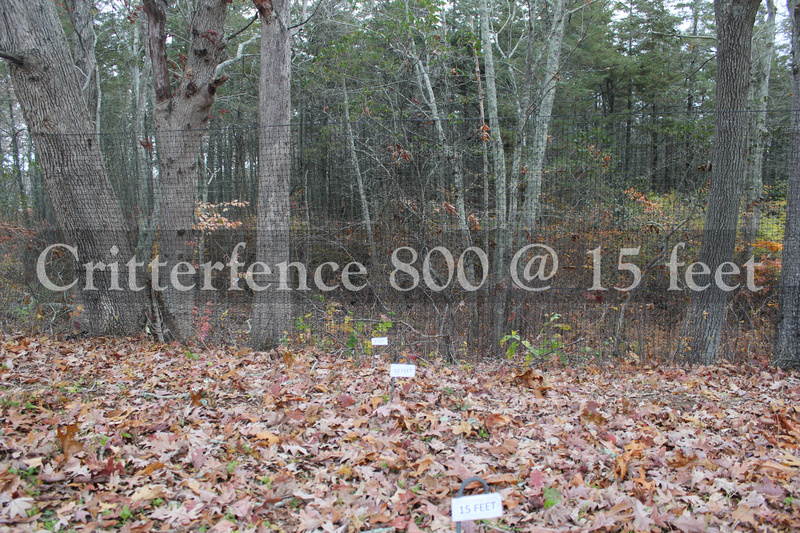 Deer fence kits are available with or without overlap. Some customers prefer to let small animals in and keep deer only out. Small opening size mesh - available in different opening sizes 1/4" - 1/2" and up to keep even the smallest animals out. This is important if you are installing a fence to keep out other animals besides deer (a vegetable garden fence for example). Choose a bottom wire of 1" or smaller for rabbits. Can be buried in a trench - our small opening mesh is hot dip galvanized after welding then black PVC coated for long life, even with fence to soil contact. This is typically used to keep out moles which burrow. No-climb fence systems and fences with a top to keep in or out all animals including cats, squirrels, predator birds, coyotes & more. Choose a fence kit with a top for growing berries. Our fence kits with a top include 1" opening size mesh to also keep out birds. All black posts, ground sleeves, gate hardware, post hardware and even hogring connectors - this means from as little as 20 feet away your fence will disappear. We have the least visible fence system in the world with exclusive parts you won't find anywhere else. 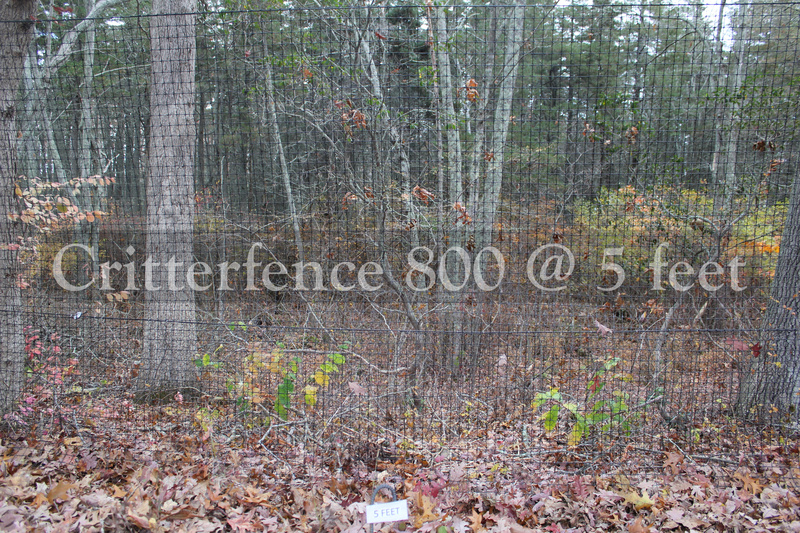 The less visible your fence is the more effective it will be at keeping out deer. Research has shown that if deer can't judge the height of a fence they won't try and jump it. For deer you need the least visible fence that is strong enough - if they run into it by accident they will still bounce off. 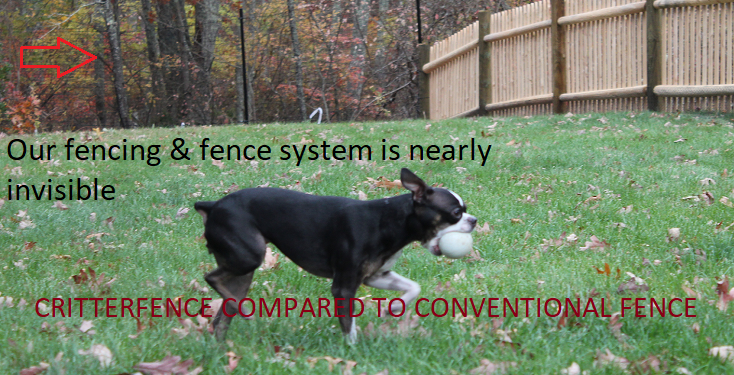 Typically customers use 800+ pound breaking strength fencing or greater for fences 500 linear feet or more. Customers that raise deer and are keeping them in will use a mesh 1000+ pounds of breaking strength or more. Some customers use 6 foot fences for small gardens but it's not recommended. The standard height for a deer fence is 7 1/2 feet or taller. 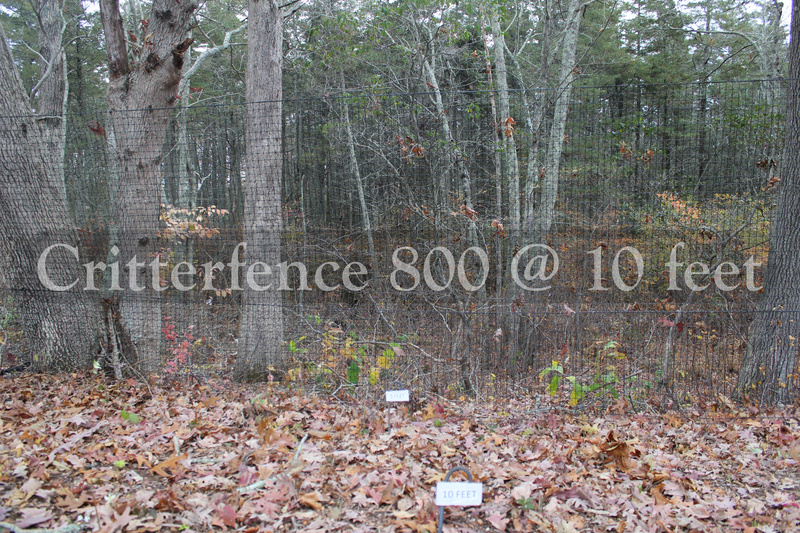 10 foot fences are usually for deer containment. 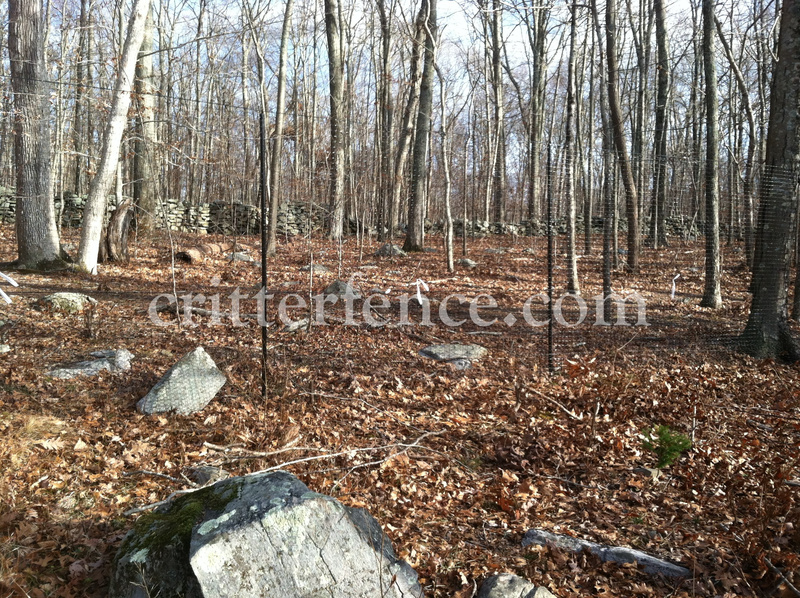 There are different grades of deer fencing material and accessories depending on your application. This includes all metal deer fencing. Please be sure to do your research in selecting what you need for your project. There are many catalog companies and resellers now online selling what appear to be the same products. 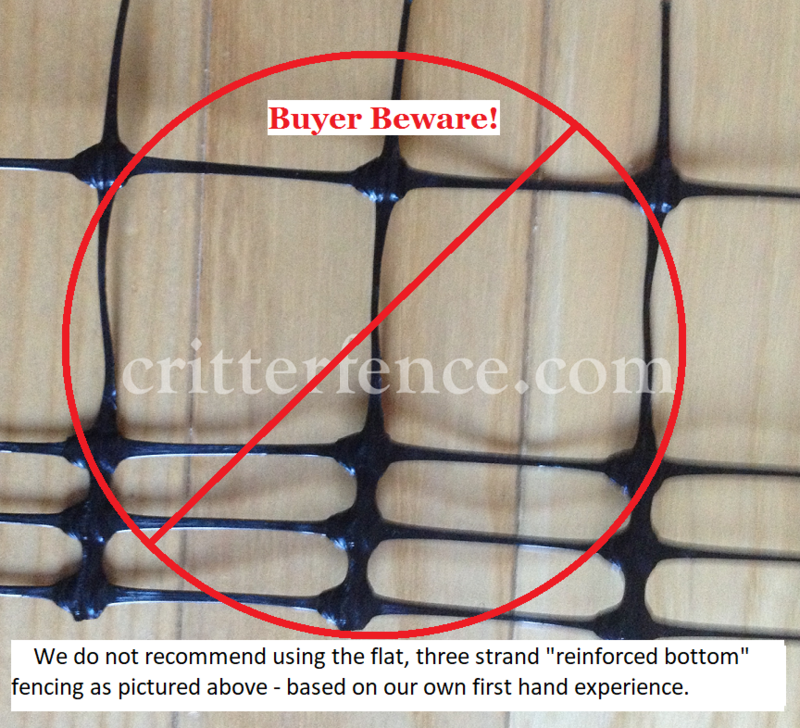 Buyer beware, many of our customers come to us because their first fence didn't work or it didn't last long. We specialize in high breaking strength, small opening size metal fencing that is galvanized after welding or weaving then black PVC coated. Popular sizes are 1"x1" and 2"x2". 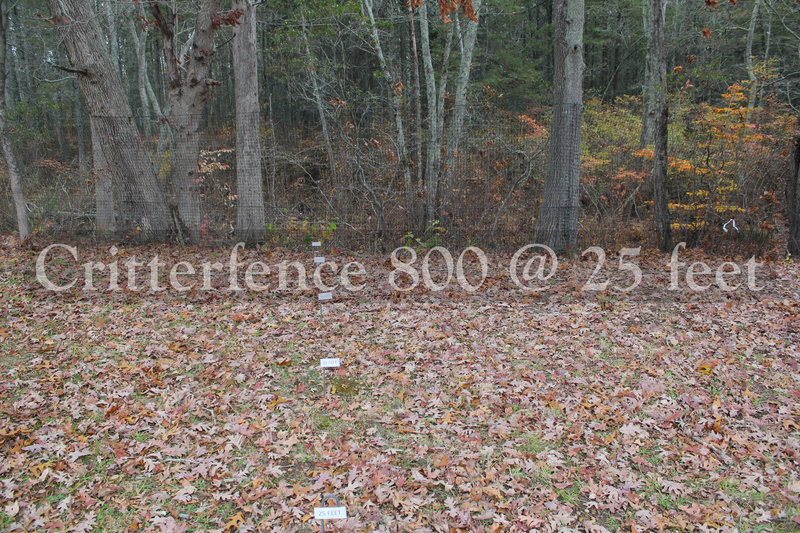 We do not offer any fence with an opening size larger than 2" which will trap or hurt deer and other animals. We also do not promote the use of electric fence or barbed wire fence. Electric fence is not effective for wild animals. It's most often used with farm animals where you can shock them once to teach them the danger of electric fence. Wild animals will run into the fence (deer for example) and break the strand. That one deer may not come back but the fence is now broken. 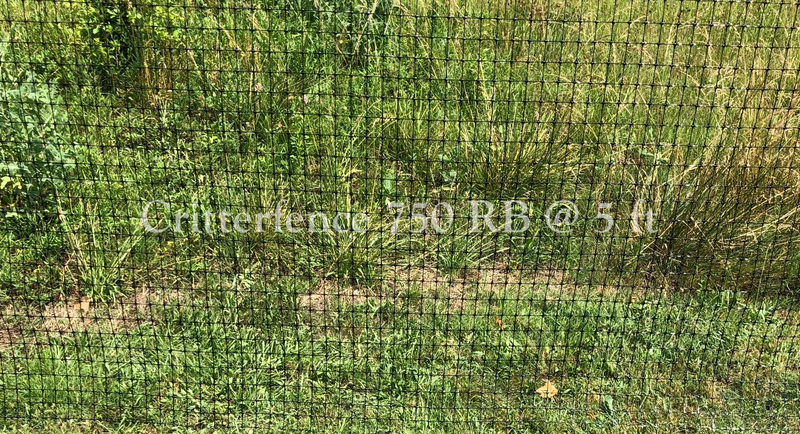 Some poly deer fence material on the market is a Flat strand polypropylene fence mesh and is often marketed with a 3 strand "reinforced bottom". Our poly fencing is a different Rounded strand or semi rounded strand polypropylene fence material. 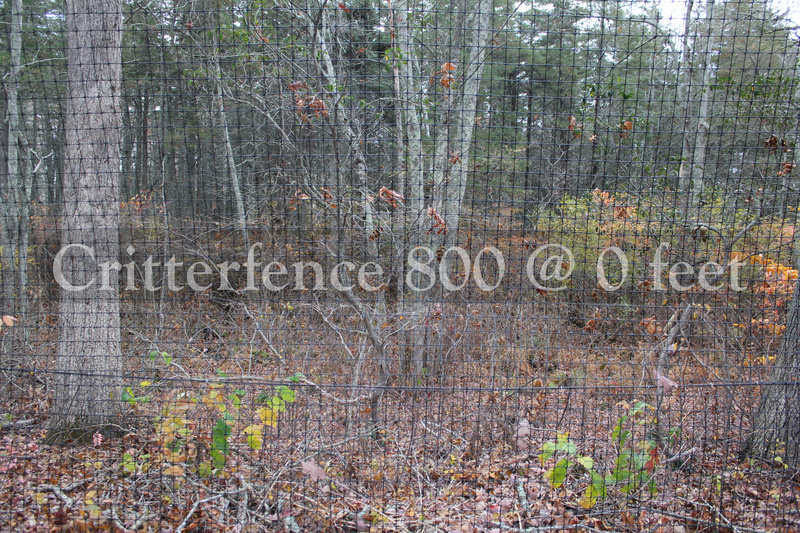 Flat strand polypropylene deer fence material (above with 3 strands of reinforced bottom) is another type of poly deer fencing on the market. The bottom often has additional strands like the photo above. We do not suggest or support the use of this fencing based on our experience with it. Rounded strand or semi round polypropylene fence material is the only type we use. 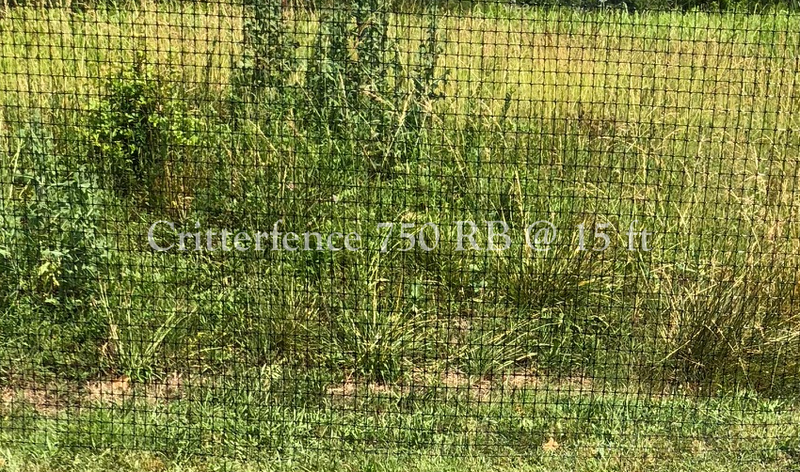 We isuggest this type of fence material for our customers and market it under three different breaking strengths: Critterfence 700, Critterfence 800 and Critterfence 1100 poly fence mesh. 1) It has a higher breaking strength per square foot - Without question, if you take two pieces of the same weight polypropylene material the rounded strand will have a higher breaking strength per tensile strand and also per square foot. Our fence material is ASTM independently lab tested. 2) It's less visible - To have an effective deer fence or a fence that will blend in well with your landscape, you need the least visible material you can get that will do the job. This is where the term invisible deer fence comes from. The beauty of this type of material is it will disappear from a short distance away (as little as 15 feet away). This is especially important for those customers trying to preserve a nice view from their back yard or don't like the look of a tall barrier fence. This material is truly an invisible deer fence from a few feet away. Flat strand fencing is much more visible by comparison, especially in the higher breaking strengths. 3) It lasts longer in sunlight - The enemy of any plastic product is direct sunlight. As time takes a toll on your fence, sunlight will break down the material and turn the black glossy material more of a matte color then finally turn it grey. It will become brittle then finally break when something hits it. Rounded strand fencing by design doesn't have any flat thin edges and has tensile strength in a complete circle. This enables round strand garden fencing to last longer outdoors than flat strand poly garden fencing. 4) It stretches less - Rounded strand poly fence material has flexibility, but does not stretch as much as flat strand fencing. If a poly fence material has too much flexibility it looses structure then needs to be supported. An extreme example would be a soccer net type material that doesn't stand up on it's own. Comparable rounded strand fencing has more structure than flat strand fence material. 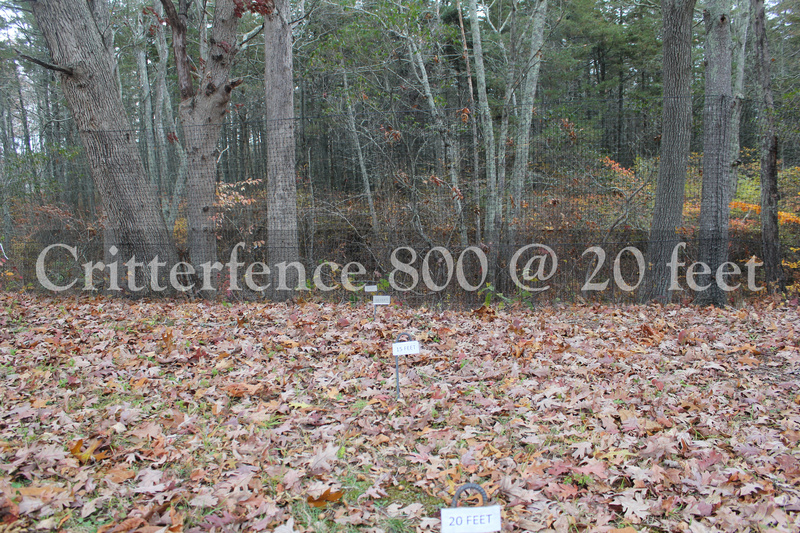 Our Critterfence Brand fence material has structure and stands up on it's own when you unroll it. 5) It has a finished edge - Most of our Critterfence brand poly fence material has one finished edge without burrs or cut ends. This clean, finished edge is the top of the fence and the other end is the bottom. The top is precision cut for easy handling and a clean look. Most flat strand fence material has two unfinished edges. Unfinished edges aren't as easy to handle. If you need fence material as a barrier (around a garden, house to back yard back to house again, or a complete perimeter including driveway) we recommend rounded strand poly fencing. If you need fence material to hang on shrubs/plants, temporary protection or seasonal protection either rounded strand or flat strand material will work for you.